CC Sabathia was not complimentary of home plate umpire Angel Hernandez after the New York Yankees lost 4-3 to the Boston Red Sox in game four of the American League Division Series on Tuesday. Sabathia actually stopped his news conference to complain about Hernandez, who had three calls overturned by replay review in the Yankees' 16-1 loss in game three a day earlier. 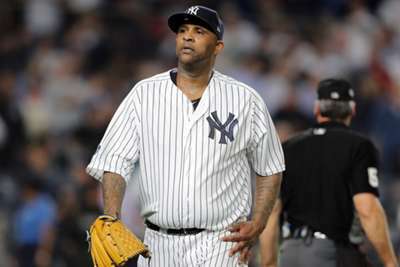 "He's always bad," Sabathia said. "He's a bad umpire. "He's absolutely terrible. He was terrible behind the plate. He was terrible at first base. It's amazing how he's getting jobs umpiring in these playoff games." Sabathia allowed three runs and five hits in three innings on Tuesday in what might be his final start in a Yankees uniform. After the first inning, he was seen speaking to Hernandez at the plate. "Throw the ball over the plate CC," Porcello told reporters, via the New York Times. "I thought Angel Hernandez called a good game. You gotta put the ball over the white part of the plate and then you get the strikes called."